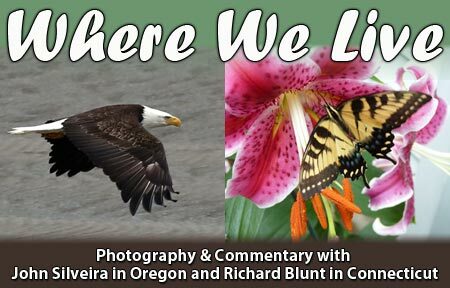 My wife Tricia and I spent Saturday, May 18, at two wonderful, must-attend events. 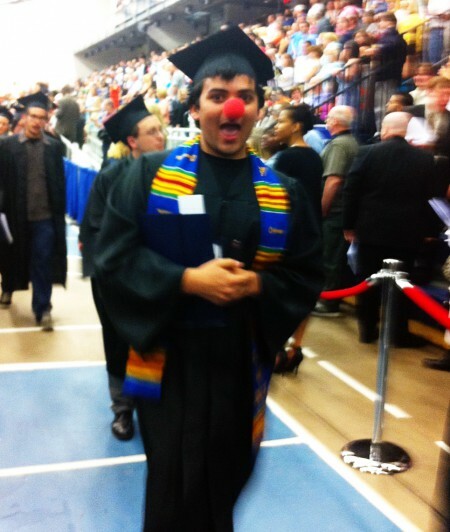 At 3pm on that day, my son, Michael, graduated from Salem State University. After the graduation ceremony we had a brief family celebration. Tricia and I then drove to the shore to attend a reunion of 124 old friends that I grew up with in the Franklin Field Housing project in Dorchester. This is one of Boston’s largest and most diverse neighborhoods. Spending a day with best-loved friends and family is a joy that we will remember for many years. Whatever the occasion, it is impossible for Tricia and me to spend time in our home town without visiting at least one of our favorite places. After the reunion, we spent the night at the hotel and left the South Shore at 6:30 Sunday morning. 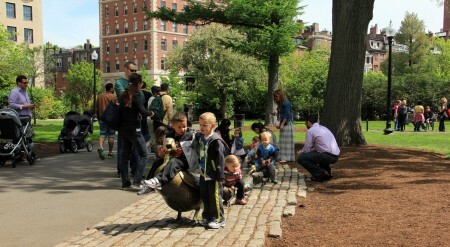 We headed for two of our favorite places: Boston Common and the Public Garden. It was a bright sunny day, and we knew from past experience that the traffic in Boston would be minimal. The Common does not get busy on Sunday until about 10 am. This gave me an opportunity to snap a few photos for this post. 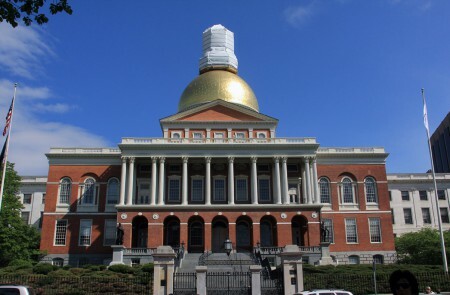 We arrived in Boston at about 8:30 am and parked the car on the corner of Beacon Street and Charles Street, and walked up Beacon Street toward the State House. Parking this close to the two parks would not possible on any other day of the week. We walked around the Common on the broad path inside the park that runs parallel to the four main streets that surround it. Below is a picture of my youngest son, Michael, after accepting his degree. My daughter, Sarah, took the shot on her cell phone. Michael graduated with a Bachelor’s Degree of Fine Arts from Salem State University. The red nose is a leftover prop from his last stage performance at Salem State. Founded on a small 789-acre peninsula in 1630 by Puritans from England, the city of Boston has more than doubled to its present size due to land reclamation efforts. Boston is a city of many firsts. Among them are this nation’s first public school, the first subway system, and the first public park—The Boston Common. 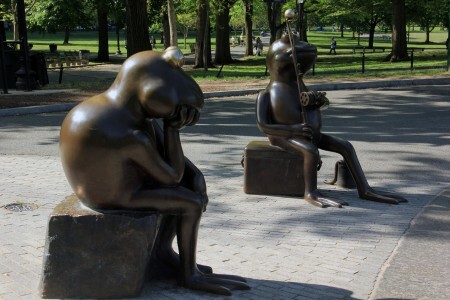 This popular park, also called “the Common” by Bostonians, is part of the Emerald Necklace, a seven-mile-long string of connected parks and parkways designed by the founder of American landscape architecture, Fredrick Law Olmsted. It was initially used as a military training ground for British troops before and during the Revolutionary War, and then as a cow pasture by local families until this was banned in 1830. Today the Common is used exclusively for recreation. There are several broad walkways where folks can escape the bustle of the city and stroll for relaxation and exercise. It is not unusual to see a political protest or a voting drive taking place during a visit. 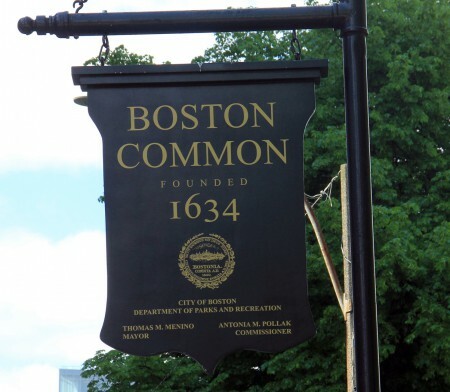 The Common consists of 50 acres bordered by five of Boston’s busiest streets: Tremont Street, Park Street, Beacon Street, Charles Street, and Boylston Street. Next door to the Common, across Charles Street, is the Public Garden, the first public botanical garden in the United States. 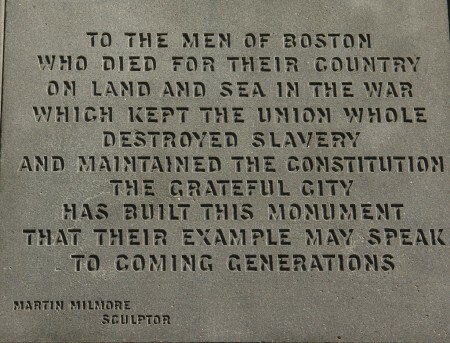 The land was purchased by Boston’s citizens for 30 pounds from Reverend William Blaxton, the first European to settle in Boston. In the background is a view of Boston’s financial district and downtown shopping area that runs along Tremont Street. 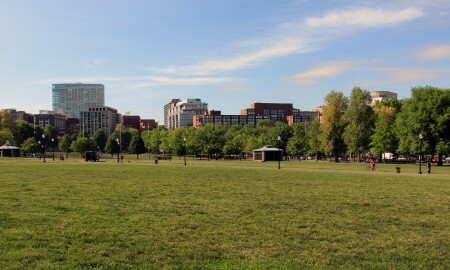 In the foreground is the large Boston Common open space that runs along Charles Street. As we walked toward the State house, Tricia noticed a man selling balloons, and thought that she might buy one for one of her special needs students that loves bright colors and balloons. She went over to the man to inquire about the price. He told her that she could have one for free if she would watch his stand while he went to see a man about a horse. So, we spent the next half hour selling balloons. 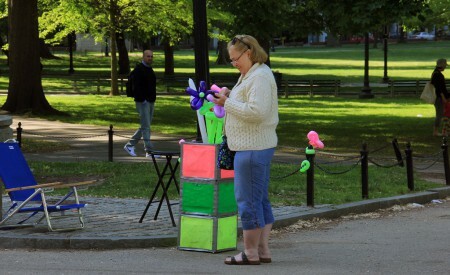 This type of friendly and relaxed behavior is the norm in the Boston Common on a warm spring day. Unfortunately, sales were slow on this morning. Called the “Hub of the Solar System” by Oliver Wendell Holmes, the State House at the summit of Beacon Hill is on a lot which had been a cow pasture owned by John Hancock. 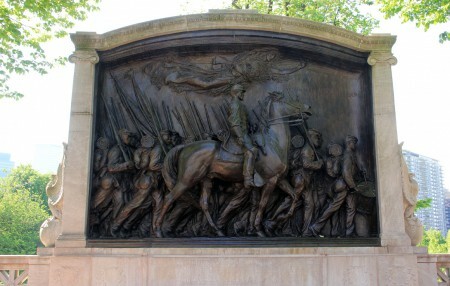 Across the street from the State House is a magnificent bronze sculpture, the Shaw Memorial. 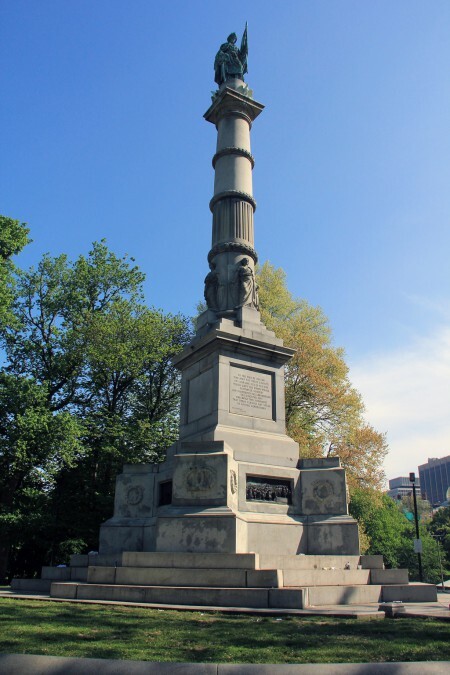 It is in honor of Colonel Robert Gould Shaw and the 54th Massachusetts Colored Regiment. This was the first in the Union Army made of free black soldiers during the Civil War. 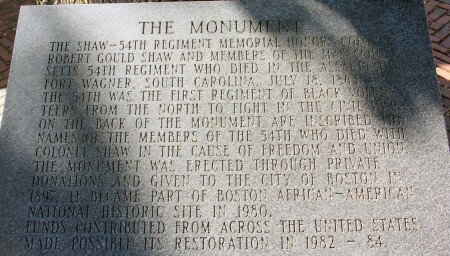 Colonel Shaw was shot and killed while leading the 54th in a failed attempt to capture Fort Wagner in Charleston, South Carolina. 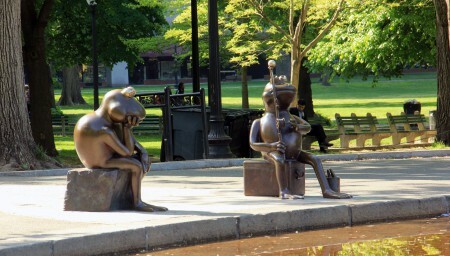 The Frog Pond is famous for its winter skating program, but to Bostonians it is the heart of the Common all year. In the winter, skaters glide and twirl on the refrigerated ice as lively music fills the air. In the spring and summer it becomes a peaceful reflecting pool and great place for a picnic. Children from all over the city play and splash in the spray pool under the watchful eyes of parents and the two bronze characters shown below. 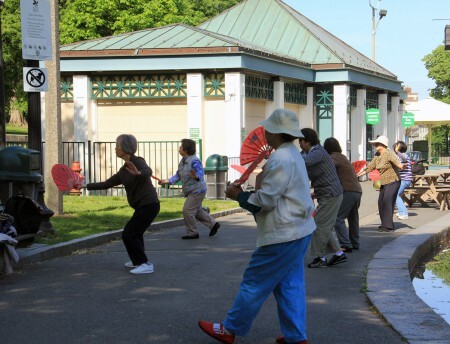 On weekends, weather permitting, local residents gather to receive instruction and practice Tai chi. This group was here for more than an hour. 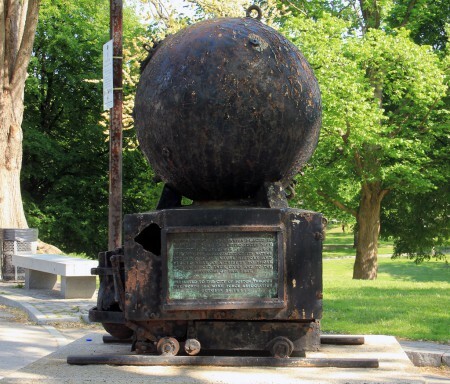 was designed by Martin Milmore and dedicated on September 17, 1877. After the United States entered World War I on April 6, 1917, the U.S. 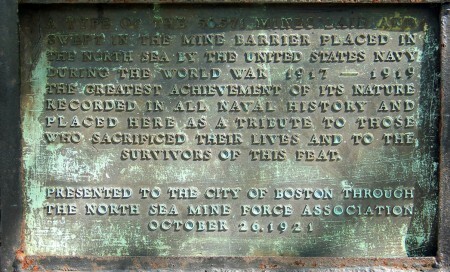 Mine Squadron One was directed to mine the 250-mile-wide entrance to the North Sea. In a very short time, 56,000 mines were launched. This mining operation was very effective and quickly rendered the German U-Boat a less productive weapon. Park Street Church was erected 1810. The church was made famous by its strong oratory. 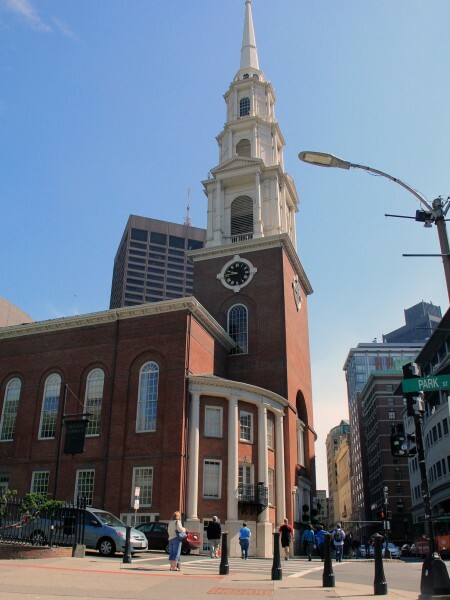 In the early days, Park and Tremont Streets became known as “Brimstone Corner.” On July 4, 1829, William Lloyd Garrison delivered his first anti-slavery speech at this church. 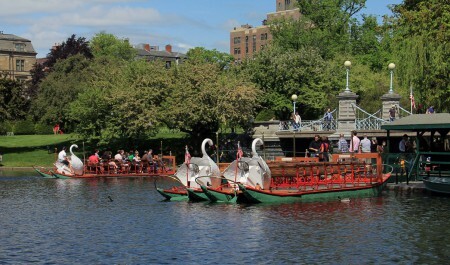 Before heading home we just had to visit the Public Garden and watch the Swan boats for a while. Mrs Mallard and her ducklings are still the star attraction. This park is one of the first public parks to open in Connecticut. It was open to the public on July 18, 1920. This first season attracted over 75,000 visitors. I believe that it is the largest public beach in this state with two miles of open beach front. I will return to this beach during the summer to gather more details and photos. Our fascination on this visit was not with the beach but with one of its flowering residents. Another teacher at Tricia’s school told her that the beach roses were starting to bloom on this beach. The decision was made the next morning and we headed to the shore. This photo was take from Center Beach. 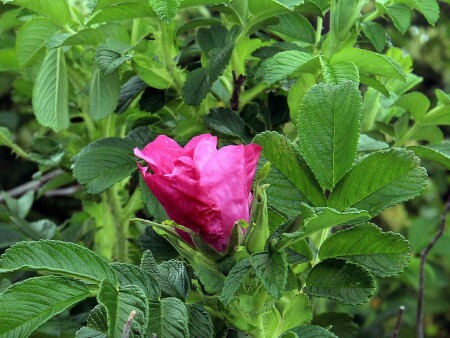 The Beach Rose, a.k.a Rosa Rugosa, is a species of rose native to Asia, where it grows on the coast, often on sand dunes. This flowering shrub can be found in numerous areas on the East Coast. 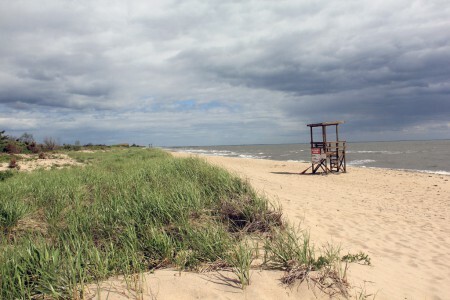 We have seen it flourishing on many Cape Cod beaches, and were delighted to find it growing on the Connecticut shore. This entry was posted on Friday, May 31st, 2013 at 10:00 pm	and is filed under Uncategorized. You can follow any responses to this entry through the RSS 2.0 feed. Both comments and pings are currently closed.